This May 1st, Socialist Action salutes all workers and immigrants as we celebrate International Workers’ Day! Attacks against workers’ organizing rights through Right to Work and other anti-union legislation are being battled across the country. Immigrant workers are being criminalized and deported through programs like E-verify and Secure Communities, while Muslim communities are being spied on by police and the FBI. Now more than ever we must follow in the great tradition of the U.S. worker’s movement to struggle in solidarity for justice and equality for all workers, regardless of race, creed, religion, gender, or sexual orientation. 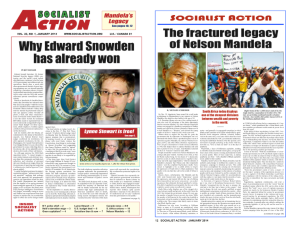 Socialist Action is committed to the struggle for an end to the unjust capitalist system and the building of a new society that meets the needs of everyone. An Injury to One is an Injury to All! Stop attacks on unions and workers’ collective bargaining rights! Top union wages for all workers! End all raids and deportations! End the oppression of all LGBTQ people. Full equality now! Stop attacks on women’s reproductive freedom! Stop police harassment, imprisonment and indefinite detention in Muslim communities! No to racist attacks on all communities of the oppressed! Fund jobs not imperialist war! May 1, 2012 in Actions & Protest, Marxist Theory & History. Money for workers, not the Wall!